He was my little helper....and then he had a huge piece! Eric makes the best milkshakes! That's what we decided to do for dinner last night! We all were hankering for something sweet! I also had a big slice of cheesecake. I have been craving cheesecake for about a week.....It had to be done! Yesterday, I finally felt like myself. I was feeling pretty bad on Friday and Saturday, so we didn't do too much. Take-out and plenty of tv/couch time was what our weekend consisted of. I have not been feeling good for a couple days. Cold/Flu...yuck. Here is a belly pic that I took today. I am thrilled with what I have for the nugget so far!!! I have been thrift shopping for baby items this past month. We are in need of almost everything, but on top of my list was a cradle and a vintage wooden highchair that was in good condition...........SCORE!!! I found both!!! $45!!! I am going to make a safety strap using one of my canvas belts! The cool thing about it is that I don't have to do anything else to this! It is in great condition and very sturdy! Diaper bag for $4!!! It kind of looks like a Vera Bradley, but it's not. For $4, it was a steal! 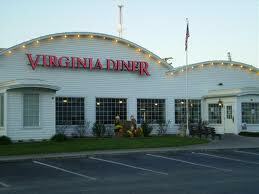 Today we took a drive about 35 miles to Wakefield, VA to eat at the Virginia Diner. Wakefield is the first place peanuts were grown in the United States. It was a great experience. 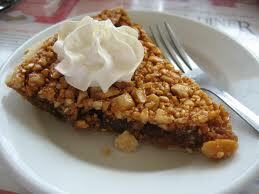 Good food and we made sure to take a whole peanut pie home with us! This week has been good...but, sooooo hot! Monday was a cleaning day. Tuesday, Asher and I went to the movie theater to see Puss and Boots. Wednesday, we went to the Y and to the grocery store. We all went to a Family Readiness Meeting on base in the evening. I got to meet Eric's new boss and his wife. 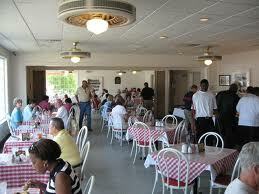 Afterwards, we went to Captain's D's.....which I had been craving for months.....it was a little disappointing. I reassured Eric that he wouldn't have to do that again for like another 5 years. Not impressive. Yesterday, we went to the Y and Asher got a haircut. We haven't been doing a lot outside this week. It has just been too hot. I walk outside and feel like I'm going to get sick. Anyway, we don't have huge plans for the weekend. Eric is taking Asher to work with him for a little bit tomorrow. I am getting my hair done. And, we are deffinitely planning on going to brunch on Sunday. That's all folks! Here is a video that I stumbled on a couple weeks ago, that I have been meaning to post. Soooo adorable!! sleemy, slimy gopher guts....chopped up monkey meat....little, dirty, birdy feet....french fried eyeballs....rolled up in peanut butter........that's what boys are made of!!! I was off by about a week! Tomorrow, I will be exactly 9 weeks! They told me everything looked great! 4th of July and weekend! We went to the Squirrels game on Wednesday evening. It was a fantastic way to spend the 4th! The fireworks were impressive and the Squirrels won! Then, we headed to Virginia Beach to meet up with the Hershey Family! We had a blast!